“In a new book, Author Unknown, (Henry Holt & Company) Mr. Foster argues that A Visit From St. Nicholas, first published anonymously in a Troy, N.Y., newspaper in 1823, closely matches the views and verse of Henry Livingston Jr., a gentleman-poet of Dutch descent. Livingston, who lived in Poughkeepsie, N.Y., died before Moore was ever named as the poem’s author. Livingston’s family first noticed the poem’s growing popularity two decades later and has insisted ever since that Livingston wrote it. But without physical evidence these claims came to naught. Last year Mary Van Deusen, Livingston’s seventh-generation descendant and an amateur genealogist, sought Mr. Foster’s help. Mr. Foster, a well-known literary gumshoe, pioneered the technique of studying the details of a text’s wording and syntax to establish authorship, using computerized archives to look for telltale influences. He is best known for identifying Shakespeare as the author of the anonymous poem Funeral Elegy and the journalist Joe Klein as author of the novel Primary Colors. Mr. Foster has become the Livingston camp’s ardent partisan, frequently comparing Mr. Moore in the book to Dr. Seuss’s Grinch. HAPPY HOLIDAYS FROM ESL VOICES! Language Skills: reading, writing , and speaking. Materials: article excerpt, materials from this lesson plan. Objectives: Students will review the arguments for and against the authorship of the poem The Night Before Christmas and discuss their conclusions. They will also create similar poems, and drawings for this holiday. Students will practice reading, speaking, and writing. 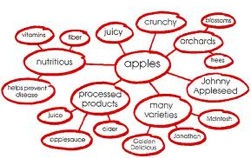 Directions: Have learners brainstorm to build a list of all of the words they can think of connected to the terms: Christmas, santa claus, poem. 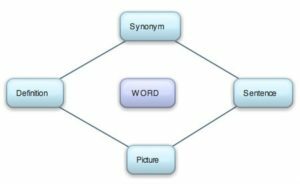 Directions: Students are to infer the meanings of the words in bold (from the article) and use a dictionary, thesaurus, and word chart for assistance. 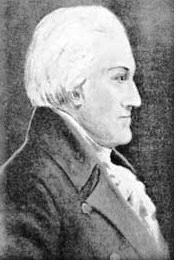 Clement Clarke Moore, a wealthy Manhattan biblical scholar. Don Foster was an English professor and a scholar of authorial attribution. Moore was accuses of committing literary fraud. She was Livingston’s seventh-generation descendant. Mr. Foster is a well-known literary gumshoe. Mr. Foster has become the Livingston camp’s ardent partisan. He is known for studying the details of a text’s wording and syntax. He uses computerized archives to look for telltale influences. The Night Before Christmas has become an American icon. The poem helped recast St. Nicholas. Directions: have students complete the sentences from the article by selecting the correct words or phrases. 1. Clement Clarke Moore has always been credited with___. 2. His his authorship was challenged by___. 3. Moore was a wealthy ___biblical scholar. 4. Better known as___ it became one of the most widely read poems in the world. 5. Don Foster, an ___at Vassar College. 6. In a new book,___. 7. Mr. Foster argues that ”A Visit From St. Nicholas,” first published anonymously in a Troy, N.Y.,___. 8. Henry Livingston Jr., was a gentleman-poet of___descent. 9. Livingston, who lived in Poughkeepsie, N.Y., ___before Moore was ever named as the poem’s author. 10. But without ___these claims came to naught. The Livingston’s family first noticed the poem’s growing popularity two decades later. Mary Van Deusen was Livingston’s seventh-generation descendant. She was also a amateur genealogist. He pioneered the technique of studying the details of a text’s wording and syntax. His case is still untested by other scholar. Before 1820 American pictured St. Nicholas (Santa Claus) as skinny. 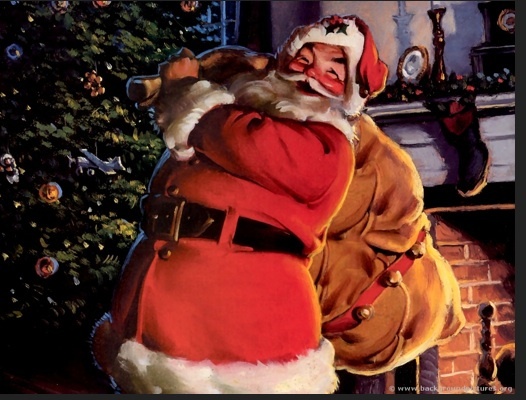 The poem helped recast St. Nicholas as a jovial elf and turn Christmas into a time for giving gifts to children. In Mr. Foster’s account, Moore, owner of an estate covering what is now Chelsea, was too much of a grouch to write such a playful poem. 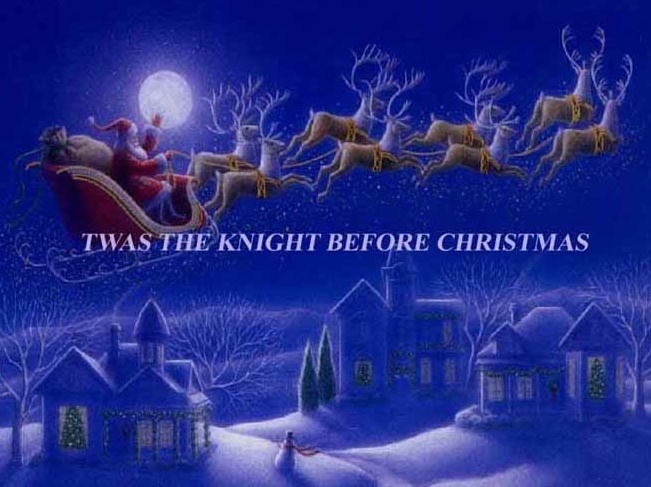 Directions: In your groups, take the first 2 or 3 lines from the poem The Night Before Christmas, and create new verses. Then have each group present their verses to the class. “Dickens wrote A Christmas Carol within six short weeks following his trip, and he began writing immediately upon his return. He walked the streets of London by night, turning the story and its characters over and over in his head. These walks were a metaphor—Dickens’ figurative journey was a trip into his own past, both pleasant and powerful, and intensely personal. The real Ebenezer Scrooge was Ebenezer Scroggie. Dickens has misread Scroggie’s tombstone in a Scottish cemetery to read ‘mean man,’ and wrote it down in his notebook for later use. Who Was Tiny Tim? Scrooge’s sister, Fanny, was based on Dickens sister Fanny whom he adored. Many of young Scrooge’s memories are those of Dickens and his sister… Dickens stayed with Fanny, her husband, and their severely hampered young son, Henry Burnett Jr. Dickens placed his nephew of his favorite sibling at the center of his new Christmas tale. Where Did The Cratchits Live? The Cratchits lived at 18 Bayham Street, in Camden Town. How do we know this exact address? Dickens describes the stroll Bob Cratchit took everyday to work. It is the same route Charles took as a boy into the city. The Cratchits were based on John and Elizabeth Dickens and their family (Charles’ parents). The eight Dickens lived in a four room house, exactly like the Cratchits on John Dickens paltry clerk’s salary. Language Skills: reading, writing and speaking. Vocabulary activities are included. 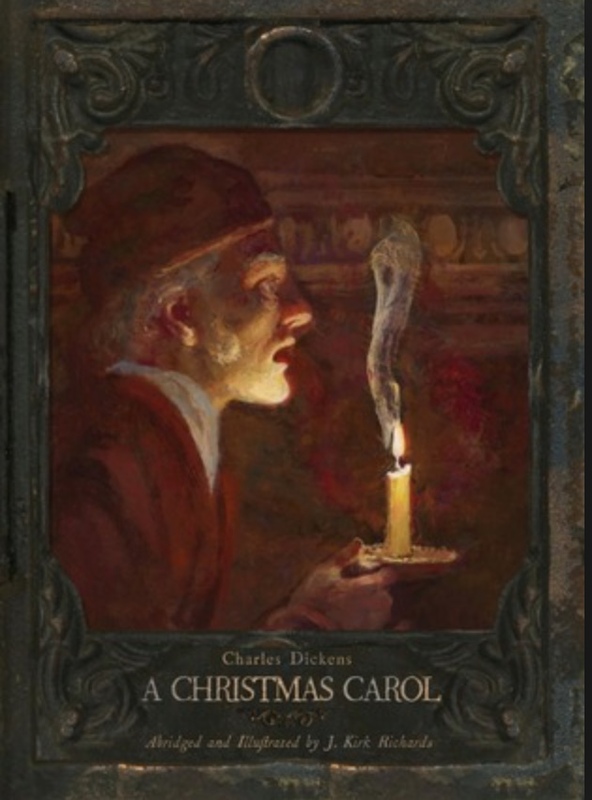 Objectives: Students will achieve a better understanding of the story A Christmas Carol, by Charles Dickens by learning literary devices and terms (e.g., imagery, symbolism, protagonist, themes) used for analyzing stories. 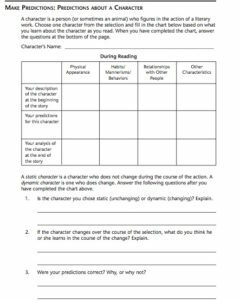 They will also learn how to analyze the relationship between characters, and events and in the story using these literary devices. 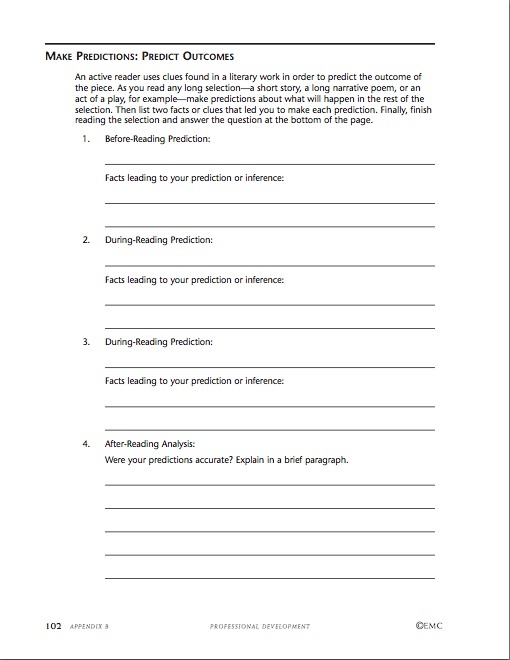 Reading Strategies: Students will make predictions based on the title; draw conclusions and make generalizations about what they have read by utilizing background knowledge, looking for the main ideas, making notes, highlighting or underlining specific information, and by answering discussion questions. They will learn new vocabulary through inference, highlighting unknown words, and using the dictionary. Background information: Some points about the life of Charles Dickens to help students make connections to the story. Charles John Huffam Dickens (1812 – 1870) was an English writer and social critic. He created some of the world’s best-known fictional characters and is regarded by many as the greatest novelist of the Victorian era. Dickens left school to work in a factory when his father was incarcerated in Marshalsea debtors’ prison in Southwark, London in 1824… To pay for his board and to help his family, Dickens was forced to leave school and work ten-hour days at Warren’s Blacking Warehouse... he earned six shillings a week pasting labels on pots of boot blacking. The harsh working conditions made a lasting impression on Dickens… becoming the foundation of his interest in the reform of socio-economic and labour conditions for he poor. Despite his lack of formal education, he edited a weekly journal for 20 years, wrote 15 novels, five novellas…and campaigned vigorously for children’s rights, education, and other social reforms…His plots were carefully constructed, and he often wove elements from topical events into his narratives. His 1843 novella, A Christmas Carol, remains popular and continues to inspire adaptations in every artistic genre, Oliver Twist and Great Expectations are also frequently adapted, and, like many of his novels, evoke images of early Victorian London. 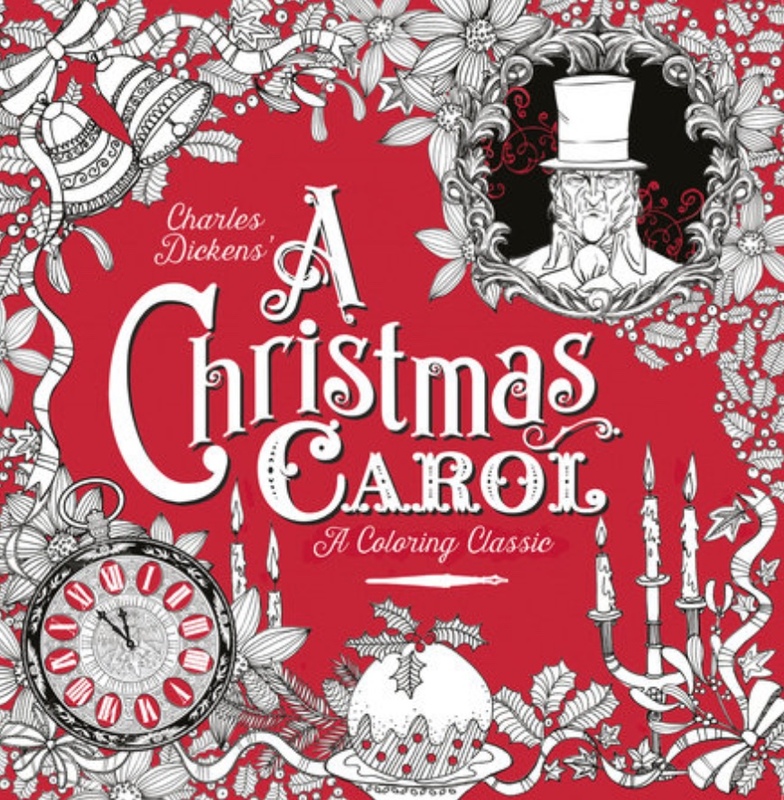 2- What prompted Charles Dickens to write the story A Christmas Carol? Early in 1843, as a response to a government report on the abuse of child laborers in mines and factories, Dickens vowed he would strike a “sledge-hammer blow . . . on behalf of the “Poor Man’s Child.” That sledge-hammer was A Christmas Carol. The Cratchit family is based on Dickens’ childhood home life. He lived in poor circumstances in a “two up two down” four roomed house which he shared with his parents and five siblings. Like Peter Cratchit, young Charles, the eldest boy, was often sent to pawn the family’s goods when money was tight. Like many poor families the Cratchit’s had nothing in which to roast meat. They relied on the ovens of their local baker which were available on Sundays and Christmas when the bakery was closed. At the time Dickens wrote A Christmas Carol Christmas wasn’t commonly celebrated as a festive holiday. 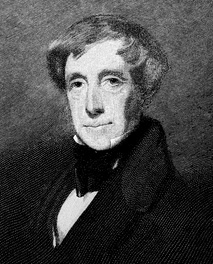 In The Pickwick Papers and A Christmas Carol Dickens’ descriptions of feasting, games and family unity combined with his message that Christmas was a time “when want is keenly felt and abundance rejoices” helped revive popular interest in many Christmas traditions that are still practiced today. In 1867 Dickens read A Christmas Carol at a public reading in Chicago. One of the audience members , Mr. Fairbanks, was a scale manufacturer. Mr. Fairbanks was so moved that he decided to “break the custom we have hitherto observed of opening the works on Christmas day.” Not only did he close the factory on Christmas day, but he gave Christmas turkeys to all of his employees. 3- Why did Dickens use Staves instead of Chapters in A Christmas Carol? Instead of using the word chapters, which divides a piece of writing in a book, Charles Dickens used staves to signify that the novel was a carol in prose form.In music, a stave or staff is the series of horizontal lines and four spaces and is the archaic form of a verse of stanza in a song. In the book “A Christmas Carol,” each stave or chapter represents a different story. Dickens wrote each chapter in a form of Christian allegory of redemption about Christmas and used the word stave to remind readers that he created the book with carols in mind. 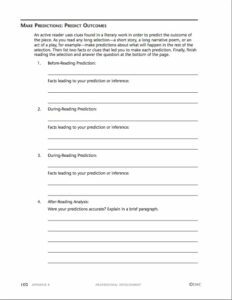 Directions: Students may use these reading charts by Pace High School as pre-reading, while-reading and post-reading tools to aid their comprehension of the events and characters in the story. Directions: Place students in groups and let them discuss the following questions. Do you celebrate Christmas? Describe how you your family and friends celebrate. Have you ever met someone who was very cheap and mean during Christmas? If so, describe this person to your group members. If you could help some people during the Christmas season would you? Explain how you could help. Directions: Place students in groups and have them infer the meanings of the words in bold font taken from the story. The vocabulary lists are taken from each of the five Staves in the story. They can use this Vocabulary Chart by Learnnc.org as a guide. Marley was dead, to begin with. There is no doubt whatever about that. The register of his burial was signed by the clergyman, the clerk, the undertaker, and the chief mourner. Scrooge signed it. And Scrooge’s name was good upon ‘Change for anything he chose to put his hand to. Old Marley was as dead as a door-nail. Scrooge knew he was dead? Of course he did. How could it be otherwise? Scrooge and he were partners for I don’t know how many years. Scrooge was his sole executor, his sole administrator, his sole assign, his sole residuary legatee, his sole friend, and sole mourner. Scrooge took his melancholy dinner in his usual melancholy tavern; and having read all the newspapers, and beguiled the rest of the evening with his banker’s book, went home to bed. He lived in chambers which had once belonged to his deceased partner. …Scrooge, having his key in the lock of the door, saw in the knocker, without its undergoing any intermediate process of change—not a knocker, but Marley’s face…Marley’s face. It was not in impenetrable shadow, as the other objects in the yard were, but had a dismal light about it, like a bad lobster in a dark cellar. Not so much in obedience as in surprise and fear; for, on the raising of the hand, he became sensible of confused noises in the air; incoherent sounds of lamentation and regret; wailings inexpressibly sorrowful and self-accusatory. When Scrooge awoke it was so dark, that, looking out of bed, he could scarcely distinguish the transparent window from the opaque walls of his chamber. The idea being an alarming one, he scrambled out of bed, and groped his way to the window. Scrooge, starting up into a half-recumbent attitude, found himself face to face with the unearthly visitor who drew them: as close to it as I am now to you, and I am standing in the spirit at your elbow. The Spirit gazed upon him mildly… He was conscious of a thousand odours floating in the air, each one connected with a thousand thoughts, and hopes, and joys, and cares long, long forgotten! The Spirit dropped beneath it, so that the extinguisher covered its whole form;… He was conscious of being exhausted, and overcome by an irresistible drowsiness; and, further, of being in his own bedroom. He felt that he was restored to consciousness in the right nick of time, for the especial purpose of holding a conference with the second messenger dispatched to him through Jacob Marley’s intervention. It was his own room. There was no doubt about that. But it had undergone a surprising transformation. The walls and ceiling were so hung with living green, that it looked a perfect grove; from every part of which bright gleaming berries glistened. Scrooge reverently did so. It was clothed in one simple deep green robe, or mantle, bordered with white fur. And perhaps it was the pleasure the good Spirit had in showing off this power of his, or else it was his own kind, generous, hearty nature, and his sympathy with all poor men, that led him straight to Scrooge’s clerk’s; … and stopped to bless Bob Cratchit’s dwelling with the sprinklings of his torch. The bell struck Twelve.Scrooge looked about him for the Ghost, and saw it not. As the last stroke ceased to vibrate, he remembered the prediction of old Jacob Marley, and, lifting up his eyes, beheld a solemn Phantom, draped and hooded, coming like a mist along the ground towards him. The Ghost conducted him through several streets familiar to his feet; …They entered poor Bob Cratchit’s house,—the dwelling he had visited before,—and found the mother and the children seated round the fire. The Ghost of Christmas Yet To Come conveyed him, as before—though at a different time, he thought: indeed, there seemed no order in these latter visions, save that they were in the Future—into the resorts of business men, but showed him not himself. What’s to-day?” cried Scrooge, calling downward to a boy in Sunday clothes, who perhaps had loitered in to look about him. “No, no,” said Scrooge, “I am in earnest. Go and buy it, and tell ’em to bring it here, that I may give them the directions where to take it. It’s I. Your uncle Scrooge. I have come to dinner. Will you let me in, Fred?”Let him in! It is a mercy he didn’t shake his arm off. He was at home in five minutes. Nothing could be heartier… Wonderful party, wonderful games, wonderful unanimity, won-der-ful happiness! “A merry Christmas, Bob!” said Scrooge with an earnestnessthat could not be mistaken, as he clapped him on the back. “A merrier Christmas, Bob, my good fellow, than I have given you for many a year! From whose point of view is the story being told? What are the professions of Ebeneezer Scrooge and Bob Crachit? In today’s society in what context is Scrooge’s last name used? What about the phrase “Bah! Humbug!”? Identify the main characters in the story. Provide short descriptions of each. Provide examples of how Dickens uses imagery. Does Dickens provide symbolism the story? How? How did Dickens’ personal life affect his writing A Christmas Carol? 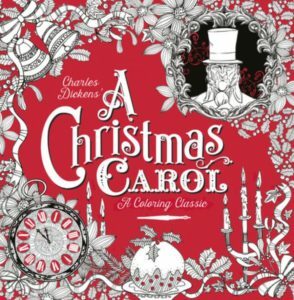 In what ways did the publication (the original) of A Christmas Carol help bring success to Dickens? Hint: Was it only financial success? Students could choose one of the themes and write an essay, giving their point of view. Have students write a short paragraph on their favorite or least favorite character in the story. Have students write a different ending for the story. 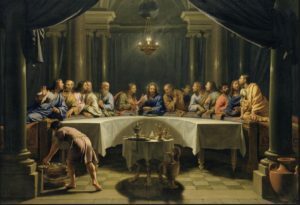 “The holiday concludes the ‘Passion of Christ,’ a series of events and holidays that begins with Lent—a 40-day period of fasting, prayer and sacrifice—and ends with Holy Week, which includes Holy Thursday (the celebration of Jesus’ Last Supper with his 12 Apostles), Good Friday (on which Jesus’ death is observed), and Easter Sunday. 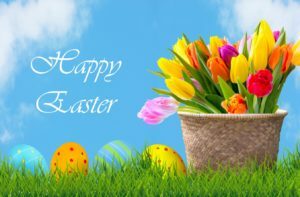 Although a holiday of high religious significance in the Christian faith, many traditions associated with Easter date back to pre-Christian, pagan times. Easter 2018 occurs on Sunday, April 1. However, Easter falls on a different date each year. Easter Sunday and related celebrations, such as Ash Wednesday and Palm Sunday, are considered “moveable feasts,” although, in western Christianity, which follows the Gregorian calendar, Easter always falls on a Sunday between March 22nd and April 25th. 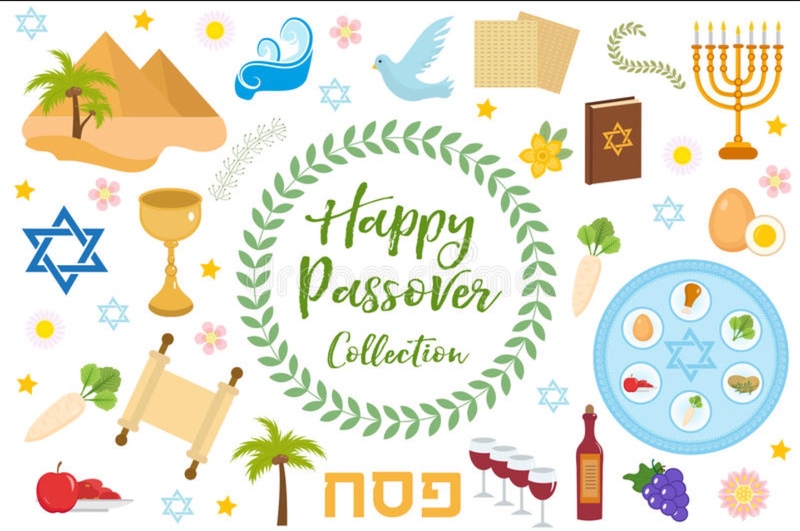 Notably, Easter is also associated with the Jewish holiday of Passover, as well as the exodus of the Jews from Egypt, as described in the Old Testament. In western Christianity, including Roman Catholicism and Protestant denominations, the period prior to Easter holds special significance. This period of fasting and penitence is called Lent. 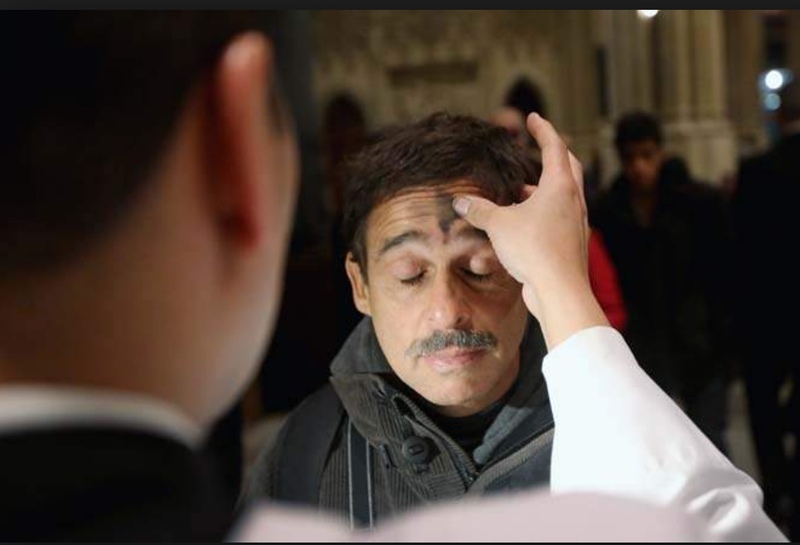 It begins on Ash Wednesday, and lasts for 40 days (not including Sundays). The Sunday immediately prior to Easter is called Palm Sunday, and it commemorates Jesus’ arrival in Jerusalem, when followers laid palm leaves across the road to greet him. 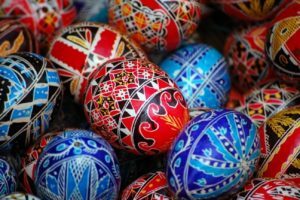 Irrespective of denomination, there are many Easter-time traditions with roots that can be traced to non-Christian and even pagan or non-religious celebrations. Many non-Christians choose to observe these traditions while essentially ignoring the religious aspects of the celebration. 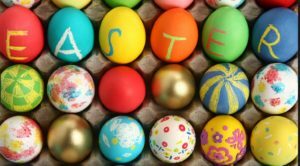 Examples of non-religious Easter traditions include Easter eggs, and related games such as egg rolling and egg decorating. It’s believed that eggs represented fertility and birth in certain pagan traditions that pre-date Christianity. 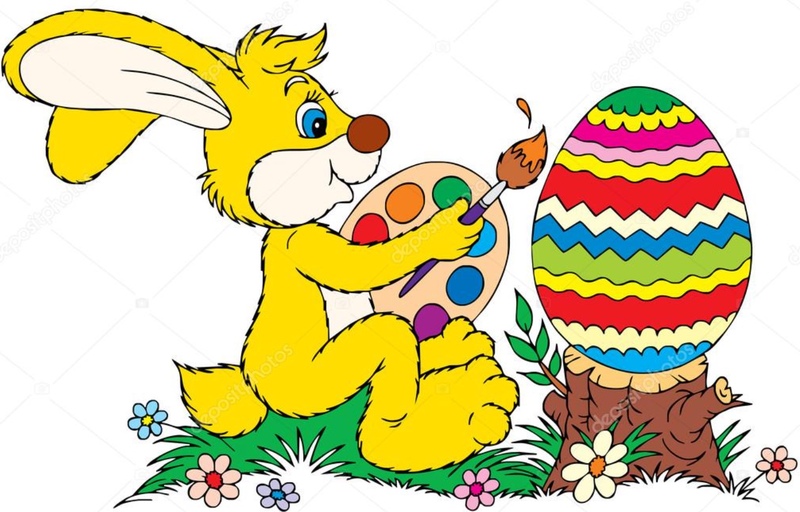 The exact origins of the Easter Bunny tradition are unknown, although some historians believe it arrived in America with German immigrants in the 1700s. Directions: Have students use the KWL chart to list the information they already know about the Easter holiday. Later in the Post- Reading segment of the lesson, students can fill in what they’ve learned about the topic. Easter is a holiday of high religious significance. Traditions associated with Easter date back to pre-Christian, pagan times. Eastern Orthodox Christianity adheres to the Julian calendar. Those who believe in Jesus’ death and resurrection are given “the gift” of eternal life. In western Christianity the period prior to Easter holds special significance. Holy Week ends on Easter. Irrespective of denomination, there are many Easter-time traditions. The exact origins of the Easter Bunny tradition are unknown. Several Protestant Christian denominations, have opted to formally abandon Easter traditions, deeming them too pagan. An Easter dinner of lamb also has historical roots, since a lamb was often used as a sacrificial animal in Jewish traditions. Easter is a Jewish holiday. 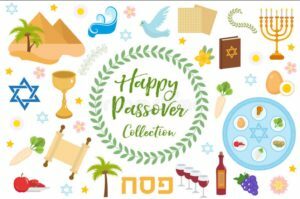 Easter is also associated with the Jewish holiday of Passover. 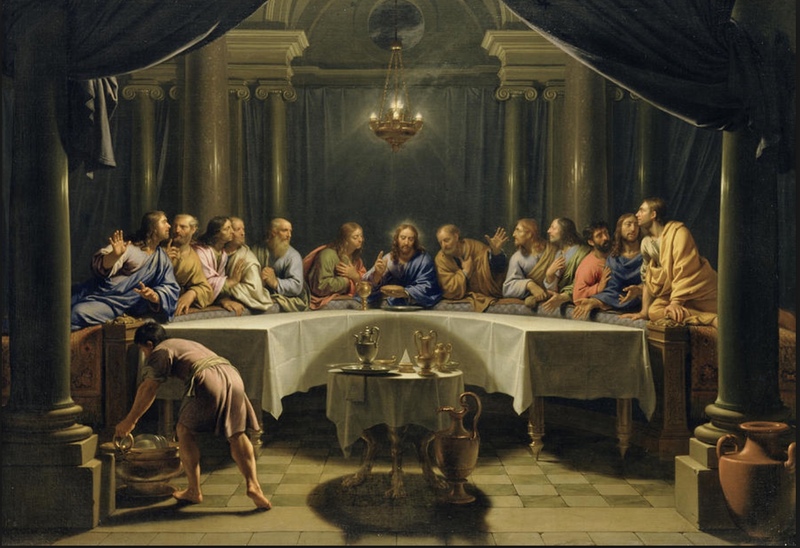 The Last Supper was essentially a Passover feast. In western Christianity the period prior to Easter holds no special significance. The Sunday immediately prior to Easter is called Palm Sunday. Palm Sunday commemorates when palm trees were first grown. In Eastern Orthodox Christianity, Easter rituals start with the Great Lent. Mostly adults participate in Easter egg hunts. The exact origins of the Easter Bunny tradition are known. ___ some denominations ___Protestant Christianity, Easter Sunday marks the beginning ___ Eastertide. 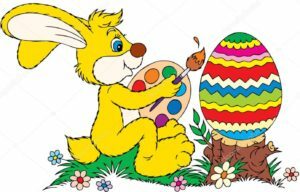 Despite its significance ___ a Christian holy day, many ___ the traditions and symbols that play a key role ___ Easter observances actually have roots ___ pagan celebrations. He was sentenced ___ death ___Pontius Pilate, the Roman prefect ___ the province of Judea ___ 26 ___ 36 A.D. 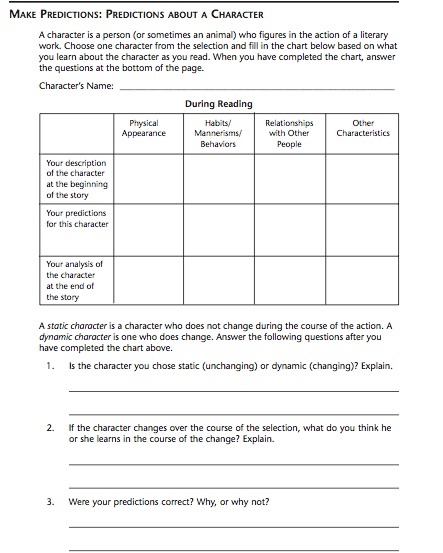 Directions: Have students fill in the last column of the KWL chart if they used one in the pre-reading segment of this lesson. 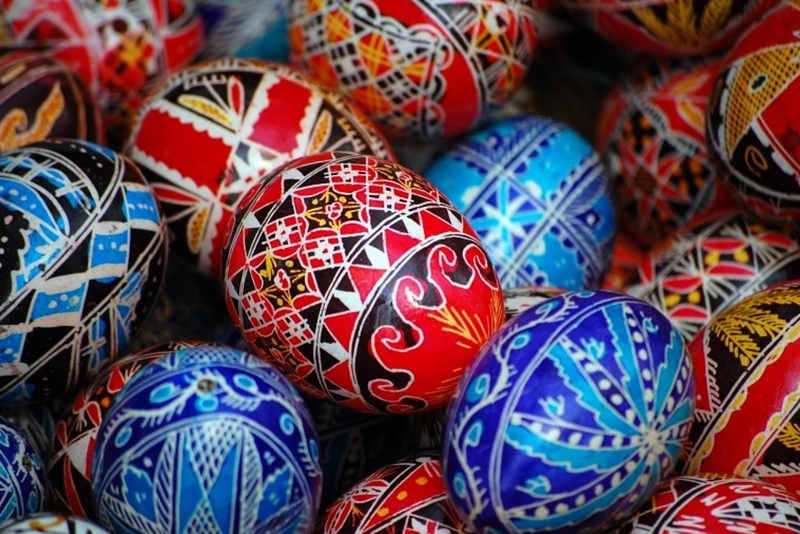 Is the Easter holiday celebrated in your country? Are there any special traditions in your family to celebrate Easter? From reading the article, do you think Easter was celebrated more long ago? Explain why or why not. 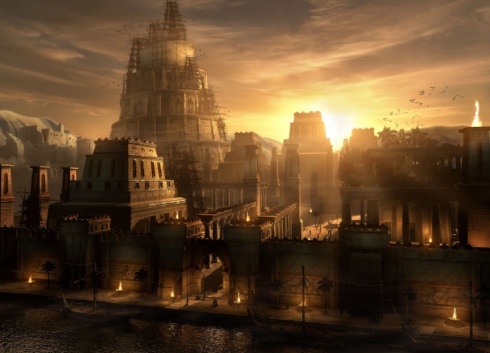 “The earliest recorded festivities in honor of a new year’s arrival date back some 4,000 years to ancient Babylon. Throughout antiquity, civilizations around the world developed increasingly sophisticated calendars, typically pinning the first day of the year to an agricultural or astronomical event. 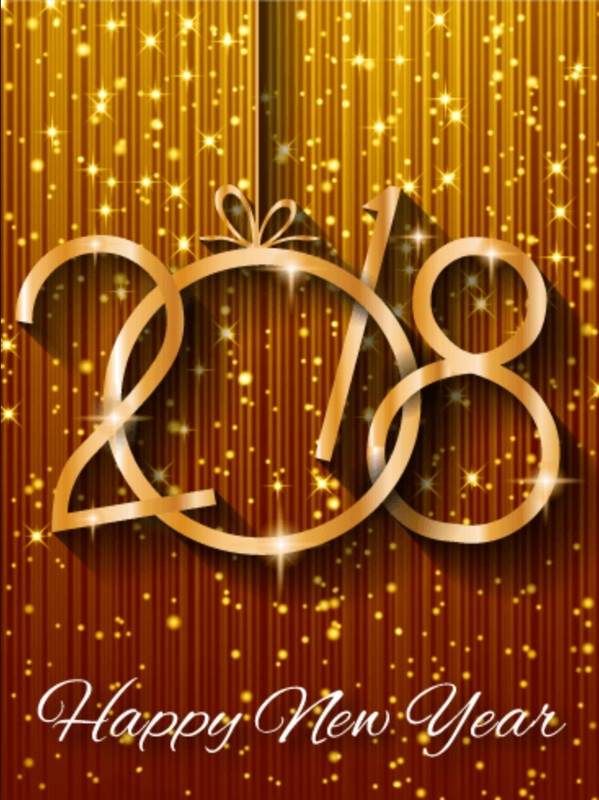 In many parts of the world, traditional New Year’s dishes feature legumes, which are thought to resemble coins and herald future financial success; examples include lentils in Italy and black-eyed peas in the southern United States. Because pigs represent progress and prosperity in some cultures, pork appears on the New Year’s Eve table in Cuba, Austria, Hungary, Portugal and other countries. 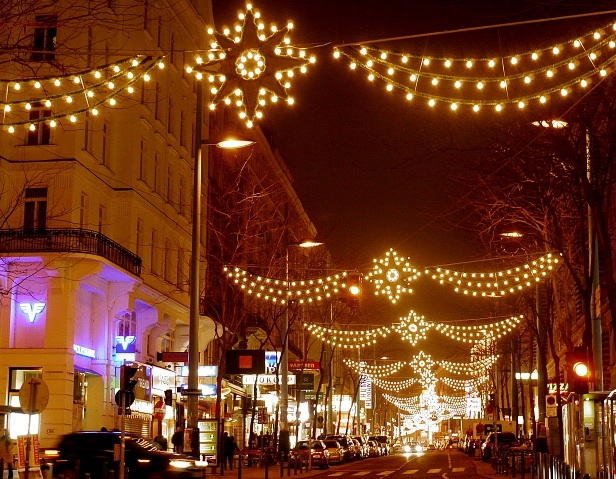 New Year Celebration, Vienna, Austria. Photo Image gallery. 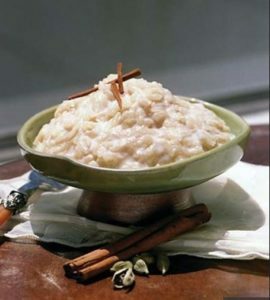 In Sweden and Norway, meanwhile, rice pudding with an almond hidden inside is served on New Year’s Eve; it is said that whoever finds the nut can expect 12 months of good fortune. In Sweden, it is believed that whoever gets that one peeled almond hidden inside the rice pudding at Christmas will get married within a year. Credit: the scoop. 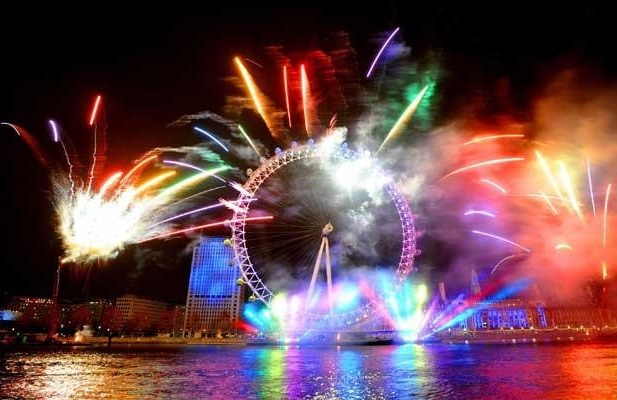 The London Eye on the River Thames during New Year fireworks and celebrations. The Telegraph. 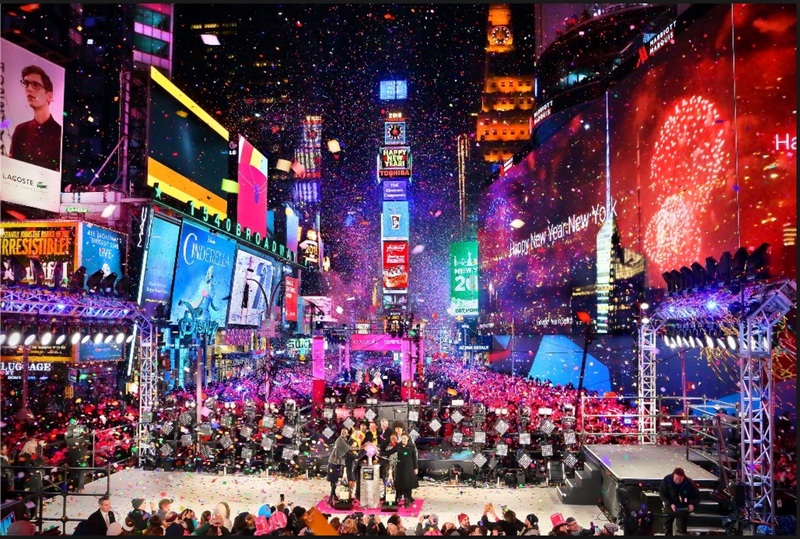 New Year Celebration New York City’s Times Square. Photo- C. Morris. Materials: Student handouts (from this lesson) and access to article. 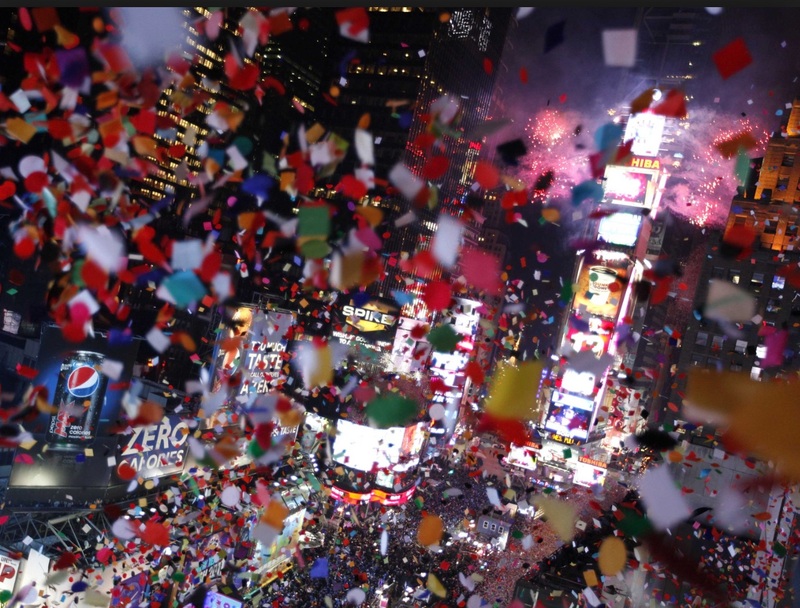 Objective: Students will read and discuss the article about New Year’s celebrations with a focus on improving reading comprehension and learning new vocabulary. At the end of the lesson students will express their personal views on the topic through group work and writing. Directions: Read the title of the post, and article. Analyze the photo(s) to see if you can predict what information the article will discuss. Then based on this information, make a list of ideas, words and phrases that might be in the article. 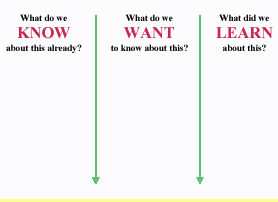 Directions: Have students use the KWL chart to list the information they already know about New Year’s celebrations. Later in the Post- Reading segment of the lesson, students can fill in what they’ve learned about the topic. 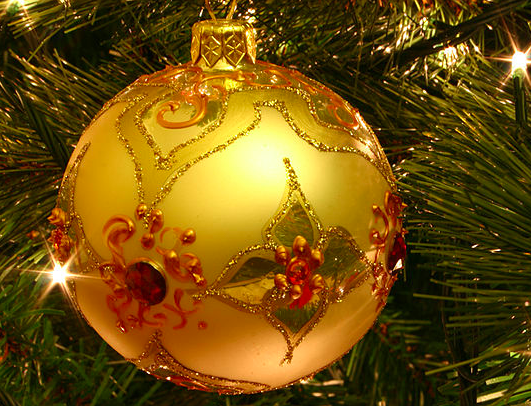 Today, most New Year’s festivities begin on December 31st. 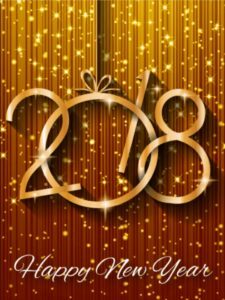 New Year’s Eve is the last day of the Gregorian calendar. Common traditions include attending parties, and eating special New Year’s foods. Other traditions include making resolutions for the new year and watching fireworks displays. The earliest recorded festivities date back some 4,000 years to ancient Babylon. Throughout antiquity, civilizations around the world developed increasingly sophisticated calendars. The calendars would pin the first day of the year to an agricultural or astronomical event. In Egypt the year began with the annual flooding of the Nile, which coincided with the rising of the star Sirius. The first day of the Chinese new year, meanwhile, occurred with the second new moon after the winter solstice. 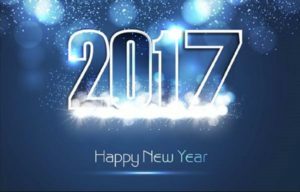 Civilizations around the world have been celebrating the start of each new year for at least five millennia. 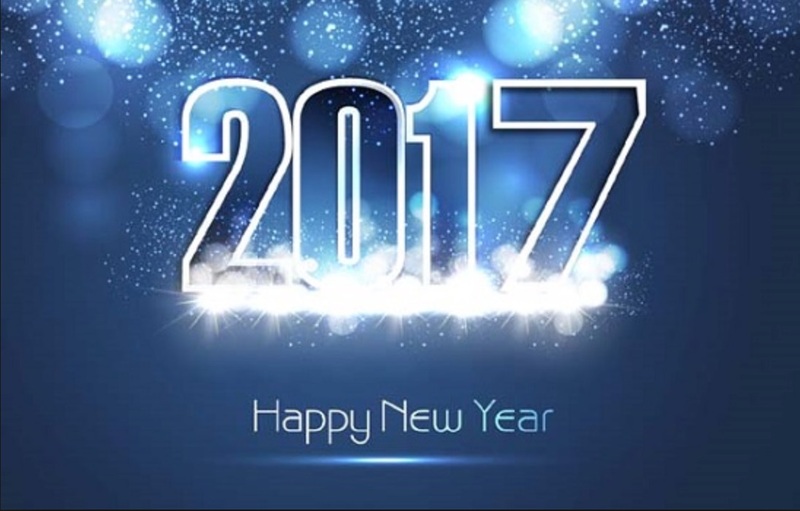 The earliest recorded festivities in honor of a new year’s arrival date back some 4,000 years to ancient Rome. In medieval Europe, Christian leaders temporarily replaced January 1 as the first of the year with days carrying more religious significance, such as December 25 (the anniversary of Jesus’ birth). In many countries, New Year’s celebrations begin on the evening of December 3 and continue into the early hours of January 1. Revelers often eat specific foods that are believed to bring good crops for the coming year. Grapes in Spain, round fruits in the Philippines, suckling pig in Austria, soba noodles in Japan are all considered good-luck food. Other customs that are common in the U.S. include making resolutions. 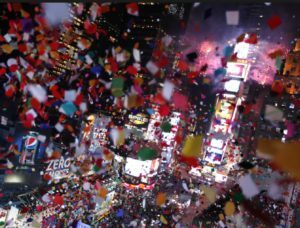 In the United States, the most iconic New Year’s tradition is the dropping of a giant ball in New York City‘s Times Square at the stroke of midnight. Directions: Identify the nouns in the following paragraph, then use the words to write a short paragraph about \ New Year celebrations in the United States. Directions: use the WH-question format to discuss or to write the main points from the article. Provide a description of when and how the New Year is celebrated in your country. If you live in the U.S. then discuss how you celebrate the New Year. Discuss the types of foods you like to eat on New Year’s Day and the significance of the food. A big New Year tradition in the U.S. is making resolutions. Discuss a few of your own resolutions and why you are making them. 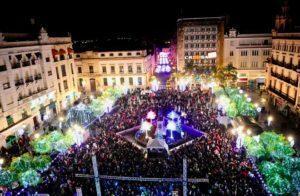 “Revelers start arriving late in the afternoon on New Year’s Eve. By approximately 3:00 p.m. If you are planning to come to Times Square and join in the festivities, you are advised to enter from Sixth or Eighth Avenue. Your chance of getting a viewing spot near the Ball (at Broadway & 43rd Street) increases the earlier you arrive. Revelers are directed by the NYPD to gather in separate viewing sections. As one section fills up, the revelers are directed by police to the next viewing section. 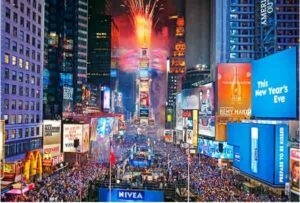 As the evening progresses, revelers continue to fill the Times Square neighborhood along Broadway and Seventh Avenue moving uptown from 43rd Street to as far as Central Park. NOTE: All attendees have to go through a security check before entering the viewing areas that are barricaded by the NYPD. Large bags and backpacks are not permitted, so don’t expect to be able to bring a a lot of snacks or drinks for your wait. Though you may be on your feet for hours, public restrooms are not set up for this event. 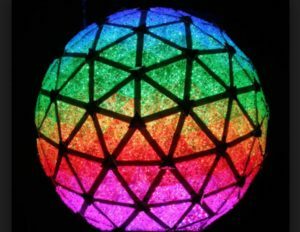 The celebration begins with the lighting and raising of the New Year’s Eve Ball atop One Times Square. 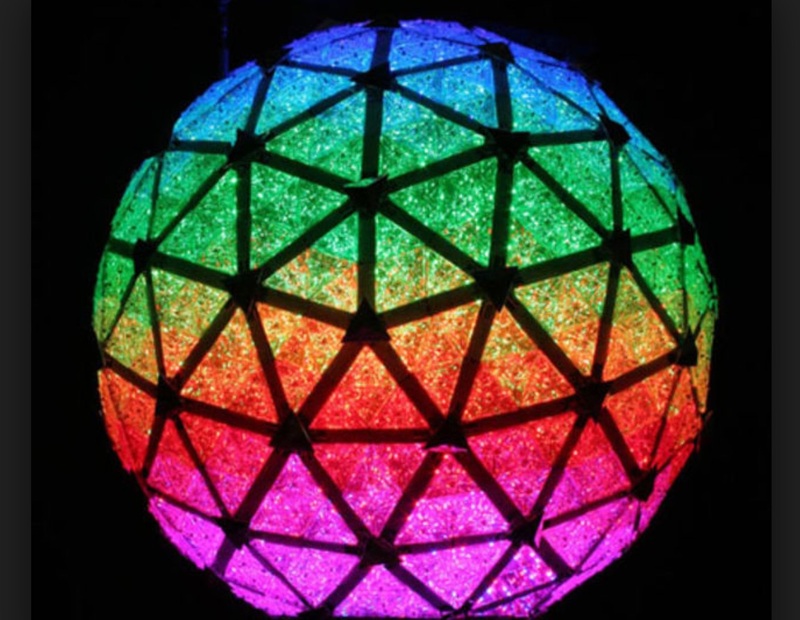 The Ball is lit at 6:00pm and begins its ascent accompanied by special pyrotechnic effects. Then, the Times Square Alliance sanitation crew, clad in bright red uniforms, begins to distribute tens of thousands of fun party favors—those famous hats, glasses, and noisemakers— to the Times Square revelers to help cheer in the New Year. Sixty seconds before the big moment, the New Year’s Eve Ball begins its descent. At the stroke of Midnight, the Ball’s lights on are turned off as the numerals of the New Year “2017” burst to life shining high above Times Square.